Shawn DeSouza-Coelho is a writer, theatre theorist/practitioner, and professional magician based in Toronto, Ontario. He recently completed his MA (English, Experimental Digital Media) at the University of Waterloo, exploring the intersections between narrative and the act of play in videogames. He also steams a good ham. In 1975, Mihaly Csikszentmihalyi published his landmark study into what he termed flow, the “optimal state of inner experiences” in which “there is order in consciousness” (Csikszentmihalyi ch.1). This order is produced when “attention [. . .] is invested in realistic goals, and when skills match the opportunities for action” (Csikszentmihalyi ch.1). This is often referred to as the flow state. When a rock climber reaches up towards that ledge once too far to grasp and pulls him or herself up just that little bit higher, fully investing that psychic “structure of attention” (Csikszentmihalyi ch.2) into each move, the rock climber can be said to be in a state of flow. In 2015, it is hard to find a videogame that doesn’t adhere to the tenets of this optimal experience. As Jenova Chen, designer of the widely popular and critically acclaimed Journey, argues, “[a]ssuming the content and premise are inherently appealing to the audience, designing any interactive experience, including videogames, centers on how to keep players in the Flow throughout its duration” (33). Naughty Dog’s The Last of Us (TLoU) is certainly designed with this philosophy in mind, with ample opportunities for players to match their ever-growing skills to ever-increasing challenges. But TLoU is much more than that: it is also a heart-wrenching narrative account of the relationship formed between two characters – Joel and Ellie – as they travel together in search of a cure for the infection that has destroyed most of civilization. How does flow factor into this narrative account? It doesn’t. And this is exactly what makes TLoU the breathtaking experience it is. Flow is an immediate, task-based construction. Csikszentmihalyi argues that flow exists in a ‘flow channel’ residing between anxiety and boredom, both of which measure challenges as they relate to skill level (ch.4). He believes people experience anxiety if challenges are too great for their skill level, and boredom if their skills are too great for the challenges provided (ch.4). Within the flow channel, however, “the difficulty is just right for [their] [. . .] skills” (Csikszentmihalyi ch.4), and people can become “completely absorbed by the activity” (Csikszentmihalyi ch.3). The exact activity matters very little; all that is required to enter the flow channel is an actionable task that possesses clear goals, adequately matches a person’s skill level, demands a certain level of concentration, and gives immediate feedback (Csikszentmihalyi ch.3). Indeed, flow is simply a task loop – goal, action, feedback – immediately registered by the player, traversing upwards through the flow channel as both skills and challenges increase in tandem. These flow loops manifest in TLoU via a standard scaffolding procedure contained within a typical action/adventure “mission-based structure” (Salen and Zimmerman ch.6). Scaffolding in videogames refers to the process by which players experience an increase in task complexity, with tasks requiring a wider variety of solutions as the game progresses (Sharek 1521). We see this in TLoU via the ever-increasing difficulty and combinations of three types of ‘Infected’ enemies: ‘Runners’ can be defeated with stealth attacks; ‘Clickers’ can only be taken down from stealth with a shiv; while ‘Bloaters’ cannot be defeated by stealth at all. The ever-increasing difficulty and variety of Infected enemies alleviates the boredom or frustration that comes with “doing the same thing at the same level for long”, appreciating players’ desire to gradually stretch their skills, thereby keeping them in the flow state (Csikszentmihalyi ch.4). In this precise sense, remaining within the flow state means little else than continually completing flow loops, one after another, and being aware of the loop’s completion so that the next one can begin. This is what the mission-based structure of TLoU allows players to do, framing the “pre-generated” (Salen and Zimmerman ch.6) narrative with closed environments (levels) that possess a single exit and are filled with Infected. In order to exit these environments players must skilfully encounter the Infected, and within these environments the flow state is always close at hand. TLoU, however, is more than a series of closed environments designed to induce flow. It is also a thrilling and tragic narrative account of Joel’s attempts to replace his late daughter with a surrogate – namely, Ellie. One definition of narrative follows from the argument that every act of narration is an act of communication between a donor and a receiver (Barthes, 109). In Reading for the Plot, Peter Brooks argues that the shape of that “narrative exchange” (ch.8) is determined by plot, referring to plot not only as “the organizing line and intention of narrative,” but also as a kind of “textual energetics” that is “elicited in the reader trying to make sense of those meanings that develop only through textual and temporal succession” (ch.2). It is an energetic “field of force” that propels readers forward, “building ever-larger units of meaning” in their desire for some “impending end” (Brooks ch.2). In this sense, plot is the very way a narrative is told, a “structuring operation” (Brooks ch.2) that determines how a reader is intended to interact with the totality of a given text. Narrative, as an act of plotting, manifests within TLoU in the form of an episodic structure. The game follows Joel and Ellie over the course of one year, split into four seasonal chapters and nine episodes. Within the episodes, “[c]haracters come into the story only for a short while, make their own choices, and have their own individual stories cleanly resolved, while only Joel and Ellie stay constant, carrying us through the longer story” (Abernathy and Rouse III). Central to discussion here, however, is that these resolutions and choices occur via the typical mission-based structure, wherein cinematic sequences bookend the closed environments in which gameplay proper manifests. If a tale is always told with the end in mind, these sequences propel the TLoU’s narrative forward to that end. As Brooks argues, from “the opening paragraph of most novels [. . .] the image of a desire [takes] on shape, [begins] to seek its objects” and the reader is propelled forward to the end in a kind of “dynamic of signification” (ch.2). This implies that no single narrative event stands alone. If the final scene of TLoU consists of Joel’s refusal to admit to Ellie the truth about herself, then every cinematic sequence in the game has to, in some way, reinforce that end in order for it to have any significance at all. The contradictions between flow and narrative are self-evident here. Where flow demands the immediacy of task completion, narrative demands the totality of signification. While the former requires that “only a very select range of information can be allowed into awareness” (Csikszentmihalyi ch.3), the latter requires the cognitive acknowledgement of the ever expanding “arousals, expectations, doubts, suspense, reversals, revaluations, disappointments, embarrassments, [and] fulfilments” that “drive [narrative] toward the end” (Brooks, ch.5). Practice shows the two are mutually exclusive. Immediately following an incredibly meaningful cinematic in the totality of the narrative, in which Joel teaches Ellie to use a rifle (after refusing to give her a gun earlier on), he descends into a new closed environment where enemy thugs patrol the streets and buildings. Suddenly, what was a meaningful moment in a total narrative has given way to an immediate, task-based process in which the player must punch and shoot enemies in order to progress to the next cinematic sequence. At that point, Ellie is finally given her own gun. What is meaningful in this closed, hostile environment? If play is always “an action accomplishing itself outside and above the necessities and seriousness of everyday life” (Huizinga ch.1, emphasis added), and players enter a flow state when “they stop being aware of themselves as separate from the actions they are performing” (Csikszentmihalyi ch.3, emphasis added), it isn’t Joel’s relationship with Ellie that is meaningful. Rather, it is the immediate actions of survival. What is paramount in this sequence, as representative of every sequence of its kind, are the immediate flow loops that must be completed by the player in order to progress through the environment and get to the narrative experience waiting at the other end. This is not a choice between the epistemologies of flow and narrative because truly the player possesses no ability to choose. The player must play through a flow-based sequence before the next narrative sequence, which must be witnessed before the next flow-based sequence. This is precisely why the game is so engaging. It lets each epistemology stand on its own: the presence of both in any given moment would diminish the experience of each. An illustration of how flow/narrative separation enhances gameplay is shown in a key moment near the end of the game. Ellie ignores Joel/the player. Over the course of the game, there are numerous moments where Joel encounters a platform too high to traverse alone. Whenever Joel reaches such a platform, a trigger pops up on the screen and, when the player presses the designated button, Joel braces against the wall with his hands on his knee, vaulting Ellie up to the platform. Late in the game, the player reaches a similar platform, presses the on-screen trigger, but this time, Ellie does not come. Instead, Joel stands upright as the camera rotates toward Ellie, sitting on a bench, clearly distraught. Joel calls out to her, reminding her tenderly, “Ellie. The ladder, c’mon.” Note, however, that this moment occurs in spite of the player’s input; Ellie, in some senses, is ignoring the established input-output relationship (triangle = Joel-boosting-Ellie action). At the outset and for the vast majority of the game, triangle (for the PS3) initiates this sequence, like a light switch in your living room reliably turns on a light in that room. Figuratively, this moment in the game is as if the light switch in the living room suddenly turns on the fan in the bathroom down the street. And it is this completely unexpected unresponsiveness of the characters to the player’s input, control, and controller that forcibly draws attention to Joel and Ellie’s relationship. In this moment, the epistemology of narrative shines through precisely because (much like a standard cinematic) the player no longer possesses any control whatsoever. And, as Csikszentmihalyi argues repeatedly, without “the possibility [ . . .] of control” there can be no flow (ch.3). With this in mind, however, does flow necessarily have to “step aside” for narrative to shine through experientially, and vice-versa? Or, can one be used to strengthen the experience of the other? That Ellie ignores the player’s input is telling because it brings to light the notion of ‘procedural incongruence.’ Briefly, if we view a game system as a language constructed of rules/procedures (Bogost ix) or simply an ordered ways of doing things (triggering, punching, etc. ), then procedural incongruence amounts to a shift in the procedural language of the game, such that player action (triggering, punching, etc.) at one point in a narrative is different from or incongruent with player action at another point. In Ellie’s unresponsiveness to the player’s input, the language of the game becomes different. The world as the player knows it (triangle = Joel-boosting-Ellie action) shifts and begins to exist anew in a procedurally different way. This procedural shift, however, is self-referential in the sense that it is simultaneously felt as a shift. This follows from the argument that all language is metacommunicative, even that of lesser mammals. In an act of play between two dogs, when one nips at the other, the act of biting is simultaneously an act of play and a signal of a playful act (Salen and Zimmerman ch.6). It is this self-referentiality that calls attention to the fact that flow is not only an experience constructed from the manipulation of tasks/goals/actions, but exists as an experience in and of itself that can be manipulated: shortened, prolonged, etc. over time. Flow thus becomes ∆Flow or the change of the experience of flow over time (∆ being the Greek letter ‘Delta’ and the mathematical symbol for “change of”). Indeed, if we treat flow as ∆Flow, we can begin to hypothesize ways in which immediate flow loops can lend themselves to the totality of narrative. One example of this would be thrusting the ever-growing relationship between Joel and Ellie into the procedurality itself; this way, players, in accomplishing the tasks of survival that lend themselves so well to flow, actually reinforce the ongoing narrative. 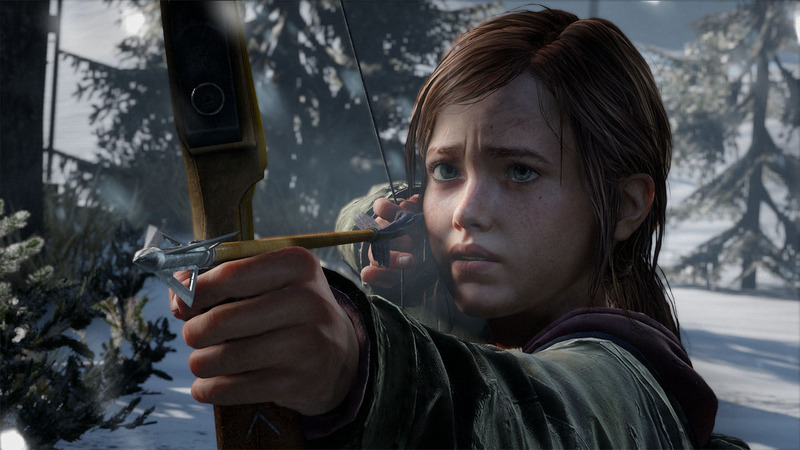 This could manifest in allowing Ellie to be a potential target for enemies (at present, Ellie cannot be harmed in battle), and, as the game progresses, making it easier for Joel to kill those who harm Ellie. This simple change maintains the immediate, task-based structure of flow, but changes the player’s experience of flow over time such that, while ‘in the flow,’ players experientially relate to the ongoing narrative and relate differently as that narrative progresses. For fans of the third-person action/adventure genre, TLoU is a thoroughly engaging experience from start to finish. Its commonplace mission-based structure allows for intense survival-action gameplay that continually tests the player’s mettle in addition to offering a meaningful narrative. The game is able to compellingly offer both because it keeps the epistemologies of flow and narrative separate. The game is designed with an understanding that the immediate, task-based nature of flow does not lend itself to the ever-expanding “signifying chain” (Brooks ch.2) of the narrative as a plotted journey over time. However, if we rethink flow as ∆Flow, understanding that flow is not something that experientially washes over players in relation to some content, but rather is at all times experienced as flow in addition to that content, then we can begin to design for/with that experience in mind. Indeed, the concept of ∆Flow allows us to ponder the reintegration of flow into the totality of narrative such that the experience of flow changes over time in accordance with the plotted events of the narrative. One such example of this is the changing procedurality governing Ellie’s presence in battle – as Joel grows closer to Ellie, it becomes easier for him to kill those who seek to harm her. This example only scratches the surface of the potential of ∆Flow to enhance the experience of narrative. Such an in-depth exploration, however, remains beyond the purview of this essay. Abernathy, Tom, and Richard Rouse III. “Death to the Three-Act Structure! Toward a Unique Structure for Games Narratives.” Game Developers Conference. 2014. Keynote address. Barthes, Roland. “Introduction to the Structural Analysis of Narratives.” Image, Music, Text. Trans. Stephen Heath. New York: Hill and Wang, 1977. 79-124. Print. Bogost, Ian. Persuasive Games: The Expressive Power of Videogames. Cambridge, MA: MIT, 2007. Kindle File. Csikszentmihalyi, Mihaly. Flow: The Psychology of Optimal Experience. New York: Harper & Row, 1990. Kindle File. Huizinga, Johan. Homo Ludens: A Study of the Play-element in Culture. Boston: Beacon, 1955. Kindle File. Naughty Dog. The Last of Us. Santa Monica, CA: Sony Computer Entertainment, 2013. Computer software. Norman, Don A. The Design of Everyday Things Revised and Expanded Edition. New York: Basic, 2013. Kindle File. Roberts-Smith, Jennifer, Shawn DeSouza-Coelho, and Toby Malone. “Staging Shakespeare in Social Games: Towards a Theory of Theatrical Game Design.” Borrowers and Lenders: The Journal of Shakespeare and Appropriation Special Issue: Social Media Shakespeare. Ed. Stephen O’Neill and Maurizio Calbi (Forthcoming 2015). Salen, Katie, and Eric Zimmerman. Rules of Play: Game Design Fundamentals. Cambridge, MA: MIT, 2003. Kindle File. Sharek, David, and Eric Wiebe. “Using Flow Theory to Design Video Games as Experimental Stimuli.” Proceedings of the Human Factors and Ergonomics Society Annual Meeting 55.1 (2011): 1520-24. PDF.